And a very Happy New Year to anyone who´s reading this!!! And another new year. Unlike last year, it's not cold and crispy, just wet and miserable and water everywhere. I still want to get my raspberries out. And the poor thermidrome garlics which are still growing in the modules. I may just have the chance this weekend if it's not too frozen, since there's a high pressure coming. Decided on a whim to hunt out some early potatoes, though got diverted by the prospect of growing International kidney, aka Jersey Royal (but one can't call it that if not grown in Jersey). Some suppliers seem to think it's a first early, some a second early and another early maincrop. Confused. Don't care as long as the plants get lost by July, then I can get marrows to ramble off through the patch. Got a bit of a shock upon finding that moonbells has been discovered by Google. 57th entry upon putting in the word allotment. And unbelieveably the second if you add the word diary! And I never linked it to anything other than my other sites! Definitely need to upgrade it now (and put a contact addy in too, though disguised so spammers can't get at me). No break in the frost. Spent the weekend trying to get this diary into the webring. And it's snowing!!!! Planted some Amsterdam Forcing carrot seed in a large pot in the conservatory, in the hope I can manage to grow some without carrot fly or forked roots. 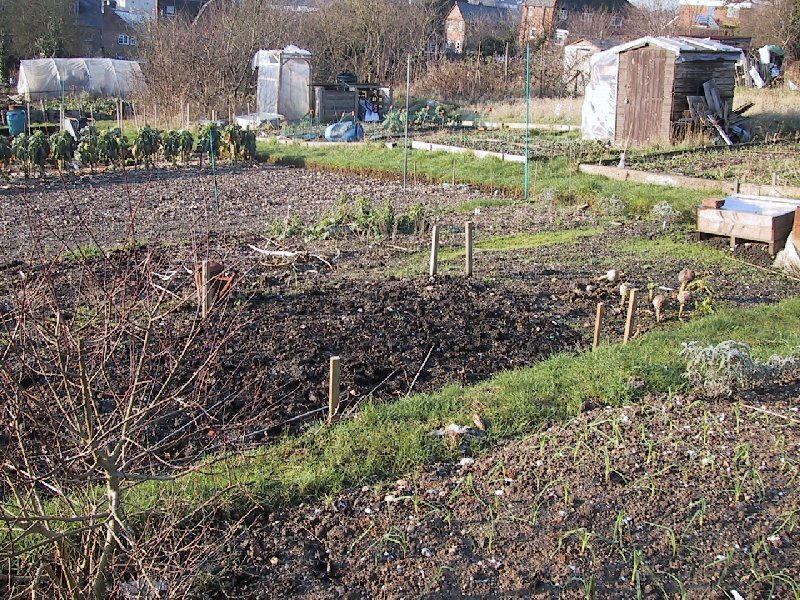 Clear and frosty, so went up to the allotment in the hope that I could rescue a leek or two. My patch is one of the luckier ones – it gets sun in winter. Half the plots, including all those near the gate and in the dip were white and solid. 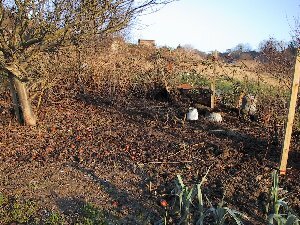 I could dig – so spent 20 minutes or so lugging bits of blackcurrant, gooseberry and forsythia bush up to the dumping area, then attacked the bolting leek bed. They are now ex-leeks. The few that were ok went into the old bucket for going home. So, to my utter surprise, did the cabbages. They looked like coconuts on stalks, and I thought they'd be mush. However, digging them up proved they were solid, and after shelling off a few layers of brown leaf, I found myself with five small cabbage hearts. Gave two to Chris, as they had been frozen or near-frozen and didn't think they could last very long. Surprise of the day – I left quite a few garlic cloves in the ground, it seems. They are quite obvious now! I have ten of the ones I deliberately planted, and well over that number growing happily in the old patch. Oops. Must move them when I've got a trowel with me. I only had the fork this time. Had a chat with Chris, and watched robins for a while. There were at least four together in a bush at one point, not trying to beat each other up. Finally got the opportunity to try something I've been curious about for ages – scorzonera. Chris had quite a few roots. Mmmm. Dug up another couple of blackcurrants, so there's only about 5 left in. Started digging a trench for the autumn raspberries, but it was still rather too frozen and I needed the spade more than the fork. Glorious day, but hunger got the better of me by about 3.15 so I went home to warm up. Nicely growing onion sets, and lots of bare ground. View over the cleared orchard area. Another cold start, which was a bit of a surprise as the forecast had said rain and mild. *shrug*. Tidied out the conservatory, in preparation for the start of planting. I hate this time of year – I want to get stuff under way and I can't ‘cos it's too early!!! Argh! Got the bag of compost inside the C to warm up ready for next weekend, and had a laugh at GQT after lunch, as Pippa's topical tip was to bring compost inside a greenhouse to warm up! Mild frost in the night, leading to a quite mild day. Everything defrosted by about 10am so after lunch went up armed with the Joan J autumn raspberries, the potbound thermidrome garlic and a spade. Started off with the raspberry trenching, digging two trenches one spit deep. Filled them halfway with the now well-rotted manure, added a bit of soil and then planted 6 canes in each trench, 15" apart. Hopefully they will do better than the summer ones (Glen Ample) did. Firmed them down and mulched with more manure. The centre of the orchard area is now all raspberries. We are due rain for the next few days, so they should settle nicely before there is any more frost. Then attacked my thug of a bramble. Some considerable time (and curses) later I had managed to prune out the old stems, tie in the new ones and reroute the canes that had been parallel to the access road, so they are now joining the others round the compost heap. This has had the effect of allowing access to the gooseberries from the road, so they will be much much easier to prune and pick. 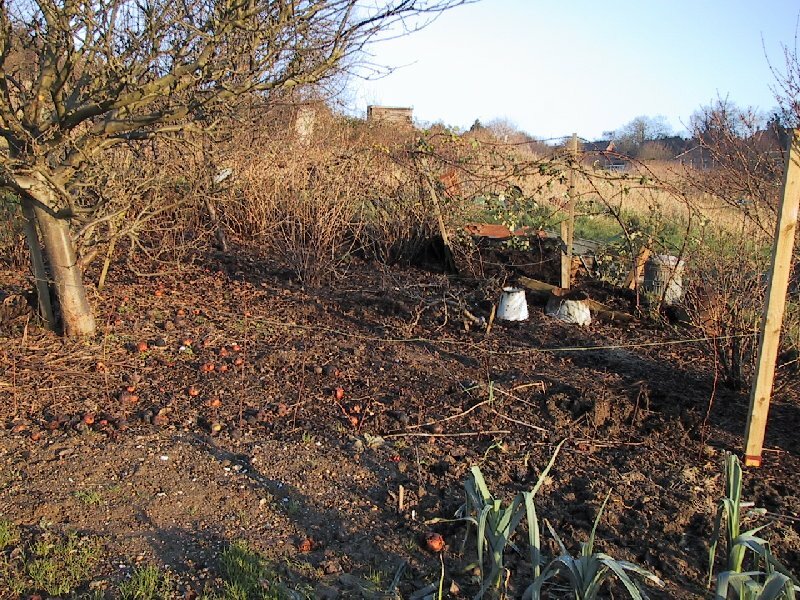 And the bramble won´t get strimmed by the council. The posts are going, though: had to straighten one up from 45o angle, and the other one just snapped off. Used a brick to bash it back in again next to the wonky one, and now they are strapped together and both upright. Moved on to the garlic, and had to dig over the piece of ground adjacent to the onions so I had somewhere to put them. Bit uneven in soil height! There are now 21 thermidrome garlics next to the onions, and another ten or so marco from the woops ones I forgot to lift last summer. Gave a clump of oopses to both Chris and Maggie. They grow quite spectacularly as a clump! Now all I have to do is start off the Long White Keeper garlic which are still in their bulbs in the house... where I´ll put them is anyone´s guess - Chris said they grow well in raspberries so I may well put them in there!!! 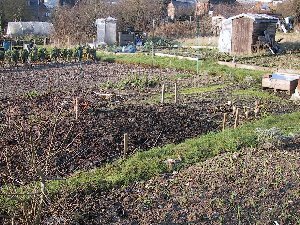 Next time I will have to clear a plot or two of the irritating grass - I hope we have some more frost this month as Bob Flowerdew in Amateur Gardening magazine this week suggests hoeing just as a frost is thawing gets the tops off nicely, leaving roots behind in the frozen soil. Neat. Supposed to be raining but wasn't, and indeed turned into a very nice day. Escaped after lunch up to see how the raspberries were faring, armed with a hoe and various bits of pruning gear. Had a go at the grass by the frames, turning some of the patches over and hoeing the rest pretty sharply. Don't know if it will kill all of the grass, but it will no doubt grow worse after having its roots disturbed than before. Still rather muddy. Tidied up the old cabbage bed, removing the roots (no clubroot here thank goodness) and then the radishes. Giant tubers or what! Doubt if they are edible, so chucked the lot, but very amusing as they were considerably bigger than the turnips. Got rid of the bean bits too, then decided the pigeons weren't going to strafe my poor spring cabbages again so moved some of the stakes from the old cauli patch and netted it properly. Pruned some more of the gooseberries, and one of the remaining blackcurrants which had got some nice new shoots from the base. Then had a go at the buddleia while I was at it. Looks quite a lot tidier now, thank goodness.